Independent film and stage actress Anna Luna recently won her first Best Actress award at the Five Continents International Film Festival in Venezuela. She bested 9 to 12 foreign and local actresses, including a celebrated Argentine actress. Luna won for her most inspired performance as Iah Seraspi, a poor Education student who perseveres against the backdrop of extreme poverty and hardships in life in Lemuel Lorca’s Maestra (An Educator, 2017). The film also received a Special Mention citation for Best Screenplay for Archie Del Mundo. Maestra is a film based on interconnected true stories of three generation of teachers. Premiering in August at Cinemalaya Independent Film Festival, Maestra is produced by Dr. Carl Balita whose other film is Adolf Alix’s Nars. Balita is an educator, entrepreneur, and radio announcer. Director Lorca is recently nominated for his LGBTQ film Ned’s Project at the Gawad Urian last year. 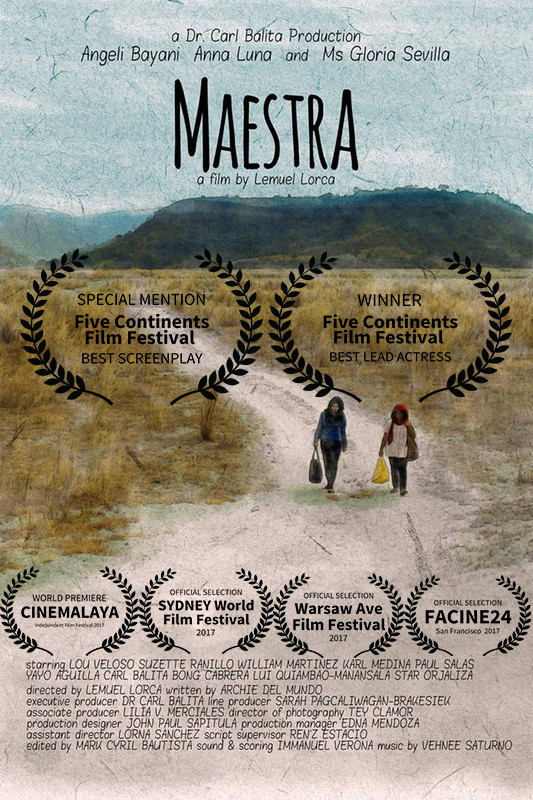 Maestra has also been selected in other international festivals, such as Warsaw Avenue Film Festival and FACINE festival in the United States, and at the Sydney World Film Festival. Luna and Del Mundo will be receiving gold trophies and certificates from the festival organizers. Del Mundo said he will donate his own trophy to his producer’s office as a sort of token of appreciation for their support. Luna will be next seen in dan Villegas' Changing Partners and Nestor Abrogena’s Tayo Sa Huling Buwan ng Taon. She has already been nominated 5 times for Best Supporting Actress, winning one for her performance in Ralston Jover’s Bendor in 2013. Luna is now being represented by Noel Ferrer. Her father, actor/businessman Rommel Luna related on Facebook post that winning Best Actress has always been their dream since the beginning of her career. Anna, whose first film was the 2010 epic musical film Emir, has trained using the the Weston Technique facilitated by filmmaker/mentor Emmanuel Dela Cruz of UFO Workshops. Lorca passionately congratulated his entire team, including the award winners: “Nakakatuwa lang. Pag indipendently produced ang isang pelikula, mga magkakaibigan lang madalas ang magtutulungan para makagawa lang ng isang pelikula. Kung minsan buwis-buhay alang alang lang sa ginagawa. Nakakakonsesnya at nakakataba ng puso ang trabaho, paghihirap, sakripisyo at kontribusyon na binibigay nila mapaganda lang ang pelikula. Kaya ito lang ang nais mo para sa mga kasamahan-ang marecognize sila at maparangalan. Ito lang ang pwede mong regalo na maibigay bukod sa pagkakaibigan at kaunting maiiaabot wag lang masabing libre. Mabuhay kayo at maraming salamat! Congrats ulit!" Maestra will continue to be featured in more international festivals until the middle of 2018. The film will have a commercial and awards qualifying run in December. Maestra also includes Angeli Bayani, Gloria Sevilla, Lou Veloso, Paul Salas, Suzette Ranillo, Yayo Aguila, William Martinez, Jerom Canlas, Bong Cabrera, Star Orjaliza, Karl Medina, Carl Balita, and Miss Lui Manansala.